Come join the adventure! We'd love to hear from you..
Want To Start Your Adventure Right Now? Join Our Troop! Before a boy can join a Scout Troop, he must meet the Boy Scouts of America age requirements by having completed the 5th grade, be 11 years old or have earned the Arrow of Light as a Webelo and he must be less than 18 years old. • Or he may be transferring from another Boy Scout Troop. • High Levels of Challenge – We believe our Scouts grow through challenge. We are not just about camping like some troops! Our program consists of a variety of activities that includes climbing, canoeing, hiking and oh yes…almost forgot…camping! Our #1 rule (besides safety) in everything we do is it has to be fun! • We are not just boy-led, we are Boy-Owned! - Scout Troops are supposed to be “boy-led”, but we try to go beyond that and use our adult leaders to mentor when necessary, but our boys run the program! We teach them not to be afraid of making mistakes because that’s where the true learning takes place! 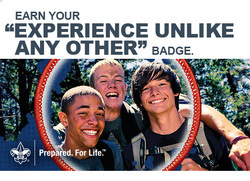 • Advancement – Our advancement program is multi-leveled and gives our boys an opportunity to grow and not only advance in rank with the normal Scouting program, but we also offer a wide variety of awards that they can earn. We encourage our Scouts to strive to EARN the rank of Eagle Scout, but in our troop Eagle isn’t the end goal as in other troops, instead it’s only a mid-range goal with the challenges going to another level so we keep their interest in Scouting long after they earn their Eagle. So how does everything sound so far? If our program sounds good to you, we encourage you to come for a visit and see for yourself. The only thing that you need to do to join is take one of the following steps…it’s that simple! Want to Start Your Adventure Right Now? Join Our Troop! It’s Easy! No Previous Scouting Experience Required! • Visit one of our Troop meetings the first three Mondays of each month at 6:30 PM at Fisher Hall at Burrell Lake Park in Lower Burrell, PA.
• Call our Scoutmaster, Mr. Don Mink at 412-418-4139 and talk to him about your interest in our troop. • Or click on the email tab at the bottom of our page and send us an email.